Medical marijuana is indeed a popular entity, but still, it’s completely mysterious. Nobody can still predict the effects of a particular strain on different individuals. It’s like a person keeps on inhaling multiple times, still, can’t feel any effect. But, when does the same thing after a few days or even a next day, the effects can be felt after half a puff even. Read More: How To Grow High-Quality Buds with A San Diego Marijuana Growers License? Before going forward, let’s understand why we get these effects in the first place. Earlier in 1988, scientists discovered one of the cannabinoid receptors in the brain as well as some of the peripheral areas. This discovery suggested that our brains are producing neurotransmitters similar to that of components present in the cannabis. Just that, the neurotransmitter produced by our body is known as “anandamide” which has been confirmed to have a role in many bodily functions such as pain management, depression, appetite, memory, and fertility. So, cannabinoids when consumed basically does the same, attach to the natural receptors just like a key fits into the lock. Hence, activating the overall system to regulate the processes of the body significantly. Now, when have understood the concept behind the activation of receptors, let move forward to understand the difference between “head high” and “body high”. Firstly, most of the highs of cannabis are usually related to one of the active components of cannabis — THC. It is known as the psychoactive component of the cannabis which usually remains unexplored because of the effects. 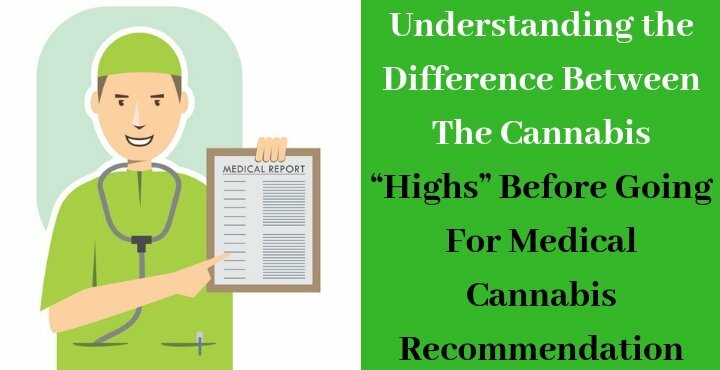 But, you will be surprised to know that sativa strains which are known for more of the CBD content as compared to THC technically produce or induce the effect referred to as “head high”. This is because of the fact that CBD promotes the effects which lead to alertness as well as optimism. So, even research says that this kind of high will be better mostly for people dealing with any form of emotional issues such as anxiety, depression, and others. Head highs are also linked to enhancing creativity as well as focus. So, people with issues like ADHD who look for medical cannabis recommendation for this particular medical conditions can actually benefit from using the mind-high effects of sativa strains. Well, thanks to THC, that is present in every strain, the above-mentioned effects will be felt almost every strains consumer. Be it, medical users or recreational users. But, if you are consuming strong indica strains, then the effects will be strong as compared to others. Usually, body high is also referred to as the “buzz sensations” or “couch lock effects”. Meaning, if you are looking for calming effects with good night sleep, then these strains will help you do that significantly. So, for people looking for effective riddance from chronic pain, spasms, migraines, or related issues, go for these strains which will help your body to enter the couch lock state easily. So, before opting for any kind of cannabis strain after obtaining medical cannabis recommendation or 420 evaluations in San Diego online, ask yourself the following question.